1867. Crompton's second motor car. Institution of Automobile President 1906-8. Rookes Evelyn Bell Crompton (Colonel R. E. B. Crompton) was born at Sion Hill, near Thirsk in Yorkshire, England on 31 May 1845 , one of five children. His passion for engineering began early. In his autobiography, Reminiscences, Crompton tells of a trip to London's 1851 Great Exhibition. For me, the unforgettable part and focus of the whole exhibition was the Machinery Hall...neither Koh-I-Noor diamond, nor Osler's crystal fountain...had any attractions for me to compare with those of the locomotives, with their brilliantly polished piston rods and brasses burnished like gold. 1854 Crompton's education was interrupted by the outbreak of the Crimean War and he was keen to see action, despite his young age. He was taken on by the Royal Navy as a cadet on HMS Dragon, commanded by his mother's cousin Captain Houston Stewart and headed for the Crimea. While there he witnessed the horrors of trench warfare but developed a taste for life in the military. 1858 Back in England, he resumed his studies, entering Harrow. While there, he dropped Greek in favour of extra mathematics. "I also made a static electrical machine having a large glass disc with which we had great fun charging Leyden jars and giving shocks to the boys," reminisced Crompton later. His practical experiments were not confined to term-time. During the summer holidays, his pet project was Blue Belle, a steam-driven road locomotive he built from scratch. On leaving school, Crompton returned to the military, joining the Rifle Brigade in India . While there, he continued to be fascinated by steam-driven transportation. He had his beloved Blue Belle sent over to him and soon his "road locomotives" were replacing the more traditional bullock-drawn carts. He took time out from his posting to India to marry the daughter of George Clarke but went back to India for a further four years before returning to Britain – with a dose of malaria picked up in Peshawur. In total he spent twenty years in India. Success in business then began Crompton's commercial career in engineering. He moved to Ipswich, going into partnership with the Chelmsford firm of T. H. P. Dennis, manufacturers of horticultural buildings and related heating plant. Here, he embarked on a project that first brought him into contact with the lighting systems that later defined his life. Crompton's relatives owned a Derbyshire ironworks (Stanton Iron Works Co) for which he designed a mechanised foundry. To be economic, the plant had to run both day and night. As a solution, he imported generators and arc lamps that were being used to great effect by the Belgian engineer Zenobe Gramme in Paris. Crompton soon began to make his own lamps that improved on Gramme's designs and those of Serrin and worked with the Swiss firm of Bürgin to develop a new type of dynamo, which soon proved popular. 1878 Crompton took over T. H. P. Dennis and Co's Chelmsford premises to form Crompton and Co, which soon became the country's leading distributor and manufacturer of electricity generating and lighting systems. Transportation held appeal for Crompton throughout his life and he was a keen cyclist. Naturally enough, he tinkered with the mechanisms of his own bicycle, increasing the wheel diameter, lengthening the pedal cranks and altering the gear ratios. With these modifications, he boasted of being able to "do as much as two hundred miles in the day without being overtired". 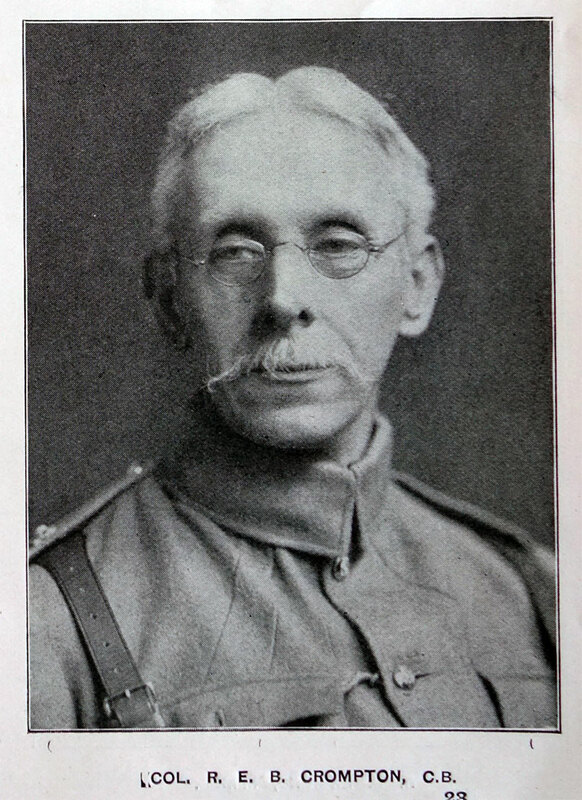 The onset of the Boer War saw Crompton return to military service, as a Colonel in the Royal Engineers. His own arc lamps started to be used as military searchlights. This was not his only contribution to military technology. During the First World War, he was asked to submit designs for "landships" that could cross trenches. These became the blueprint for the modern military tank. 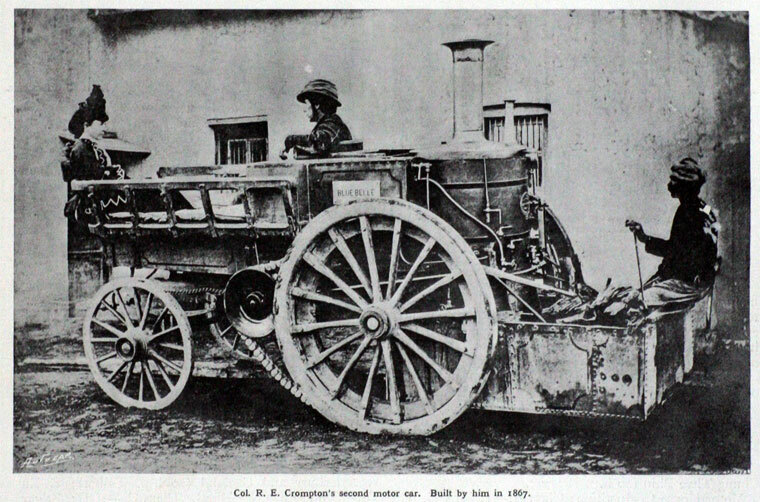 After the Boer War ended, Crompton became involved in standardization. He had long been concerned about the lack of a common terminology to describe the electrical phenomena he was seeing and the huge number of different schemes in operation. Virtually each different electricity generating network ran at a different voltage and interoperability of equipment was a huge problem. In August 1904, Crompton was asked by J. K. Gray, then president of the Institution of Electrical Engineers, to accompany him to represent Britain at the Great International Exposition in St Louis, America. At the Exposition, Crompton presented a paper on standardization which was so well received that he was officially requested to look into the formation of a permanent International Electrotechnical Commission (IEC), to deal with electrical standardization from an international standpoint. Crompton admitted afterwards that he foresaw "great difficulties" in the proposed scheme but these were eventually overcome and the IEC began to take shape. In 1906, Crompton and Charles le Maistre, whom Crompton had asked to act as permanent secretary, drew up a constitution for the fledgling IEC organisation. The IEC's first plenary meeting was held that same year in London and was attended by representatives of 14 countries. The First World War interrupted the work of the IEC and when it met again, Crompton reported that: "The meeting eventually took place at Geneva, and was attended by unofficial German representatives," says Crompton in his autobiography. "It was a matter of great satisfaction to me that our peacemaking efforts were successful. No unpleasant incidents occurred at the public meetings, and at one of the dinners which followed, the French delegates consented at my personal request to shake hands with the German representatives." But his interests in standardization were not restricted to electrical matters. A love of squash, picked up from Harrow , saw him involved in the "measuring and devising means of comparing the bounce of the various balls in circulation", according to the Tennis and Rackets Association. 1926 Crompton's role in the development of the electrical industry was recognised when he was awarded the IEE's Faraday Medal. The pace of change in the industry is highlighted by the fact that just two years later, work started on an electrical National Grid for Britain as a whole. 1927 He was invited onto the board of the new company Crompton Parkinson by Frank Parkinson the chairman of the company. Colonel Crompton left his London home for the last time in 1939 to take up residence in Yorkshire. Before leaving, he was visited by John Somerville Highfield, a member of the Dynamicables lunch club for electrical engineers of which Crompton was a founding member, and asked whether he needed anything there for his comfort. His nurse said there was no electric light and they were afraid of fire from paraffin lamps. "I hear you want an electric light at home," said Highfield. "I will see this is provided NOT off the Grid." Highfield asked Frank Parkinson, Crompton's former rival, to help and he obliged in a few days with the provision of a small private plant, much to Crompton's pleasure. Crompton died at his home, less than a year later, aged 95 with his place in the history of the practical development of electricity secure. Rookes Evelyn Bell Crompton was born in 1845, and on leaving Harrow spent a number of years on military service in India. He then founded the firm of Crompton and Co, in which capacity he was a pioneer in the adoption of electric lighting. During the South African War he organized a Corps of Electrical Engineers, and was awarded the C.B. for his services in this connection. He was elected as the first President of the Institution of Automobile Engineers in 1906, and was elected an Honorary Member in 1924. He was appointed Engineer to the Road Board (the forerunner of the Ministry of Transport), when it was first established, and was a Founder Member of the Royal Automobile Club (RAC). He died on 15th February, 1940, at the age of 94. CROMPTON, CoL., R.E., C.B., M.I.C.E., AND E.E.- Born on May 31st, 1845, and educated at Harrow, Col. Crompton entered the Army in 1863, being gazetted to the Rifle Brigade. Leaving after fourteen years' service, he was appointed second in command of the Corps of Electrical Engineers on their being raised, succeeding to the command on the death of the commanding officer. He took out a detachment to South Africa during the recent war. Col. Crompton's experience with horseless vehicles began as early as 1861 with experiments of his own, which were continued during a lengthened stay in India. Since his return from the late war he has been continually employed on experimental work for the War office Committee on mechanical traction. The cars Col. Crompton has driven are a Locomobile and the present one, a White steam car, with which he says he has obtained excellent results. Col. Crompton was a Founder Member of the Club, took part in its early tours, has for years been a member of the Club Committee, and is a Vice-chairman. AN EARLY MOTOR CAR BUILT AND DRIVEN BY COL. R. E. CROMPTON FORTY YEARS AGO. I commenced building my first motor car in the year 1861. I was then a boy, and had considerable difficulties in providing myself with the requisite tools. However, I succeeded in making a self-propelled vehicle which would carry three or four persons and climb hills up to 1 in 12, but at a very slow speed. There were two cylinders 3in. diameter by 5in. stroke. The steam distribution was by the ordinary link motion, and the engine drove by a belt on to a large diameter pulley fitted on the back axle, which also enclosed the differential or, as we then called it, "Jack-in-the-box" gear. One of the bevel wheels of the differential was bolted to the inside of the wooden nave of the driving wheel; the other was keyed on to the axle, which was a live axle. These driving wheels were wooden wheels with iron tyres of about 5ft. in diameter by 3in. width of tyre. The boiler was of the locomotive type, and was the weak point of the car; it had poor steaming power for its weight. I therefore at once commenced a new car, but it was not finished when I was gazetted to the Army and went out to India in 1863. I therefore took the unfinished parts with me. The boiler was made for me by Messrs. Lewis Olrick and Co., of Bishopsgate Street, E.C., and was of the Field type as then made for steam fire engines. I carried on the construction of this motor car during the years 1865 and 1866, and finished it in 1867. It then took the form here shown. My performances with this engine attracted the attention of the Government of India, and I was selected to take charge of an engine made by the late R. W. Thomson, which was provided with large solid rubber tyres. I wished to have rubber tyres fitted to my own motor car, but the cost was enormous, and as the car was my own private property I could not afford to purchase them, so throughout its life it continued to run on the rigid iron tyres. It may, however, be fairly said to have been the cause of rubber tyred engines being employed in India, as many people, including the Governor-General (Lord Mayo), saw my car run satisfactorily. I was afterwards given the appointment of superintendent of the Government steam train, and sent home to England to have four large "road steamers," as they were then called, built to Mr. Thomson's and my own designs. A draughtsman was engaged, and I worked at Mr. Thomson's house for several months. Messrs. Ransomes, of Ipswich, then tendered to the Indian Government for the construction of the four engines to these designs. The engines were built and sent out to India, and were worked by me during the years 1871-5. I then returned to England, owing to my wife's ill-health, and my place was taken by Mr. Richard Muirhead, who had previously acted as my assistant, and he worked the engines for several years — I believe up to 1878. During the time I worked the large engines I used my own motor car as an inspecting car to visit and watch the working of my large engines. I had many interesting experiences with my small car. I could get about sixteen miles an hour out of it on the level, and on slight down grades often ran it over twenty miles an hour. The springs were long and easy, and the engine rode very comfortably on a good road at these speeds. The engine of my second car had the same cylinders, which were removed from my first car, but in this case I fitted the differential on a counter-shaft immediately underneath the crankshaft. The vertical boiler necessitated a fixed axle; the driving wheels were therefore driven by friction belts, one on each side. These friction belts were of peculiar construction; they were of V section and consisted of chains made of malleable iron links. There were recesses at the side of these links into which wood blocks were driven end way of the grain; the blocks were then sawn off so as to fit accurately into the V grooves on the small pulley on the counter-shaft, and on the large pulleys which were secured to the large shaft of the driving wheels. This transmission was rather heavy, but it worked exceedingly well, and was quite silent; it could be easily repaired by fitting in new wooden blocks. The fuel that I preferred to use was wood charcoal, but this was costly, and I generally had a mixture, using charcoal for hill climbing and billets of olive wood for ordinary running, but sometimes I was compelled to use a native fuel, which is always used where wood fuel is scarce, namely, balls of cow dung, and I improved on these by having them made up with charcoal dust in them. This last fuel, however, gave great trouble from the immense amount of ash which ran together in the fire and made clinkers and blocked the bars, whereas with wood charcoal or olive wood the bars would keep clean for hours together. As there were no speed limits in India I frequently used this engine for ordinary social performances, taking my wife round to make calls or going on weekend trips just as we do nowadays in this country forty years later. Colonel ROOKES EVELYN BELL CROMPTON, C.B., F.R.S., throughout an exceptionally lengthy and distinguished career, occupied an outstanding position in engineering, which was all the more remarkable because of the diversity of his interests. He was born in 1845 at Sion Hill, near Thirsk, and at the age of eleven accompanied his father to Gibraltar; soon afterwards he succeeded in obtaining an appointment as midshipman in HMS Dragon, was actually in the firing line in the Crimea, and present at the fall of Sebastopol; he was later awarded the Crimean Medal and Sebastopol Clasp. Returning to England, he completed his education at Harrow and underwent a short apprenticeship at the Doncaster works of the Great Northern Railway. In 1864 he was gazetted as an ensign in the Rifle Brigade and went to India, where he was attached to the staff of the Commander-in-Chief. He soon began his well-known experiments with steam traction on roads, and in 1870 he inaugurated the Government Steam Train, under the director-general of the Post Office, with great success. His work in this direction was described in a paper which he presented to the Institution in 1879, entitled "Working of Traction Engines in India." In 1875 he returned to England and a year later went into partnership with Messrs. T. H. P. Dennis and Company, of Colchester. He also acted as a consulting engineer and was associated with Mr. P. W. Willans in designing steam-driven tramcars. Colonel Crompton joined the Institution in 1877, when its headquarters were still in Birmingham, and saw its removal to London later in that year. His membership thus covered a period of no less than sixty-three years. 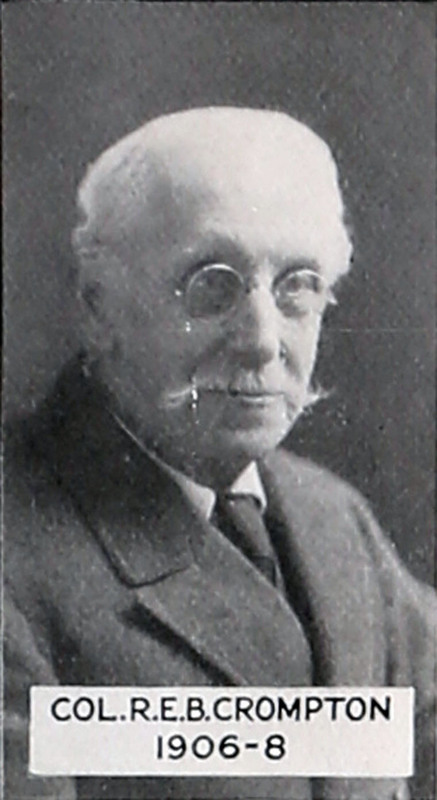 He first began his long connection with electrical engineering in 1879 when he established the firm bearing his name at Chelmsford. During the next thirty years he carried out much pioneer work in electrical matters and was responsible for important developments in electric lighting plant and in dynamo design. He introduced lighting by incandescent electric lamps, which were first installed in the Royal Courts of Justice. He also developed his lighting system a stage further when installing his five-wire system of distribution at the Royal Opera House in Vienna in 1882, and four years later his ideas were embodied in one of the first generating stations in England, which was erected on the Kensington Court estate. During the "nineties" he was much occupied with the development, with Mr. J. C. Howell, of a new type of electric battery. He went to India in 1896 to advise the Indian Government on the preparation of an Electric Lighting Act. On returning to England he took a leading part in the formation of a Corps of Electrical Engineers for the Army. He commanded the unit during the South African War, and for several years afterwards, and in the early years of the century he was appointed by Lord Roberts to reorganize the Mechanical Transport Corps. For his services during the South African War he was made a Companion of the Bath. His work in the development of motor traction continued and he became a founder member of the Royal Automobile Club, and the first President of the Institution of Automobile Engineers. Moreover, his investigations into the conditions of road surfaces led to the setting up of the Road Board, of which he was the first engineer; the results of his work were embodied in a paper, "Mechanical Engineering Aspects of Road Construction," which he read before the Institution in 1913. During the Great War he was a member of a committee appointed by Mr. Churchill in 1915, to devise mechanically propelled vehicles for crossing trenches. The result was the tank, in the development of which Colonel Crompton, with the late L. A. Legros, played a leading part. During 1914-18 he served on a Ministry of Munitions committee set up to advise on the interchangeability of screw gauges for shells, fuses, and other materials. He had, however, long been interested in standardization, and will be remembered for his work in organizing a permanent International Electrotechnical Commission, of which he was secretary. He also carried out much important work in improving standard screw threads, and with Mr. Clements designed a new thread, the British Standard Fine. Some of his most valuable services to the Institution were rendered in his capacity of a member of the Alloys Research Committee. 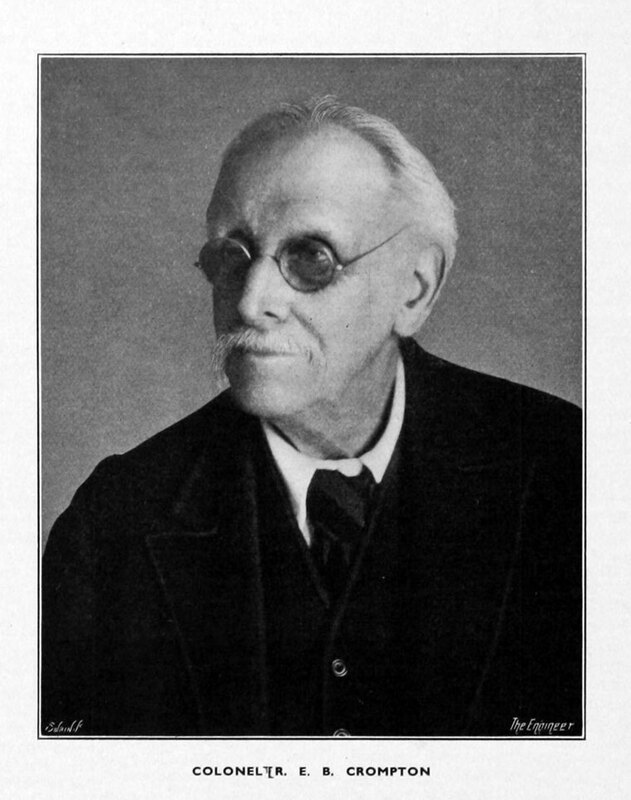 He also served on the Cutting Tools Research Committee from its inception in 1920. His wide range of interests made him a keen supporter of numerous other technical societies; he was twice President of the Institution of Electrical Engineers, and served on the Council of the Institution of Civil Engineers. In addition he was President of Section G of the British Association in 1903 and was the first President of the Institution of Highway Engineers and of the Commercial Motor Users Association; and in 1918-19 he was President of the Junior Institution of Engineers. He was elected a Fellow of the Royal Society in 1933. In 1935 he was made an Honorary Life Member of The Institution of Mechanical Engineers and was presented with the certificate at a public gathering in celebration of his ninetieth birthday. Colonel Crompton's death occurred at his home, Azerley Chase, near Ripon, on 15th February 1940, in his ninety-fifth year.